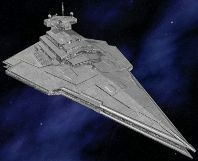 As a reward to the megacorps the comprised the Corporate Sector Authority for their loyalty during the Clone Wars, the Empire approved the sale of several hundred Victory I Star Destroyers to the CSA that were being phased out with the introduction of the new Imperator class ships. While limited by Imperial edict on their available weaponry (the original ships were stripped upon sale), their support base was excellent, as their original constructor, Rendili Star Drive, was a signatory sponsor of the CSA. Not the equal of an Imperial Victory, the CSA versions are still excellent craft and form the base of the Picket Fleet. Many of these ships would later see service against the Galactic Alliance when the CSA joined the Second Corellian Insurrection.